Credentials are utilized by Red Hat CloudForms for authentication when running Ansible playbooks against machines, synchronizing with inventory sources, and importing project content from a version control system. Each credential type used by CloudForms is detailed in the following sections. Machine credentials enable CloudForms to invoke Ansible on hosts under your management. Just like using Ansible on the command line, you can specify the SSH username, optionally provide a password, an SSH key, or a key password. They define SSH and user-level privilege escalation access for playbooks, and are used when running playbooks on a remote host. Ansible is a simple model-driven configuration management, multi-node deployment, and remote-task execution system. When designing playbooks for use with CloudForms it is helpful to utilize solutions within the playbook itself to ensure optimal implementation of playbook-backed services or automated processes. This section is intended to complement the existing documentation on Ansible playbooks and guide administrators through optimizing playbooks for use with CloudForms. Roles are ways of automatically loading certain variable files, tasks, and handlers based on a known file structure. Grouping content by roles also allows easy sharing of roles with other users. Install roles on a Red Hat CloudForms appliance with the Embedded Ansible server role activated to optimize playbooks. CloudForms will automatically install the role once it sees the requirements.yml file in the playbook. Red Hat CloudForms provides a module allowing inventoried resources such as virtual machines created using Ansible playbooks to link back to the services used to generate them. 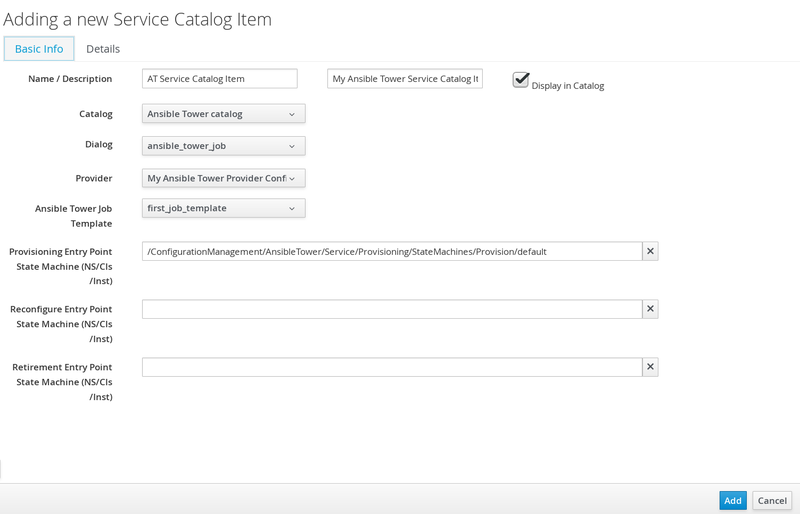 During service ordering of a playbook the add_provider_vms module will allow the playbook to connect back to the worker appliance and identify the provider resources it was responsible for generating. Once linked, the newly generated resources are available to CloudForms’s life cycle management features. This example utilizes the `syncrou.manageiq-vmdb`role. This role allows CloudForms users to modify and/or change VMDB objects using an Ansible playbook. For information on implementing and utilizing roles when writing Ansible playbooks for CloudForms, see Section 3.1.6.1, “Installing Roles on an Embedded Ansible Appliance”. 3.1.6.3. Modifying the Automate Workspace Using the manageiq-automate Role. The manageiq-automate role allows users of Red Hat CloudForms Automate to modify and add to the automate workspace via an Ansible playbook. The manageiq_automate role employs the following variables when implemented in a playbook run on a CloudForms appliance. Variables are defined in defaults/main.yml and vars/main.yml. auto_commit: By default is set to True. If set to False it will not auto commit back to CloudForms each call to a set_ method in the manageiq_automate module. 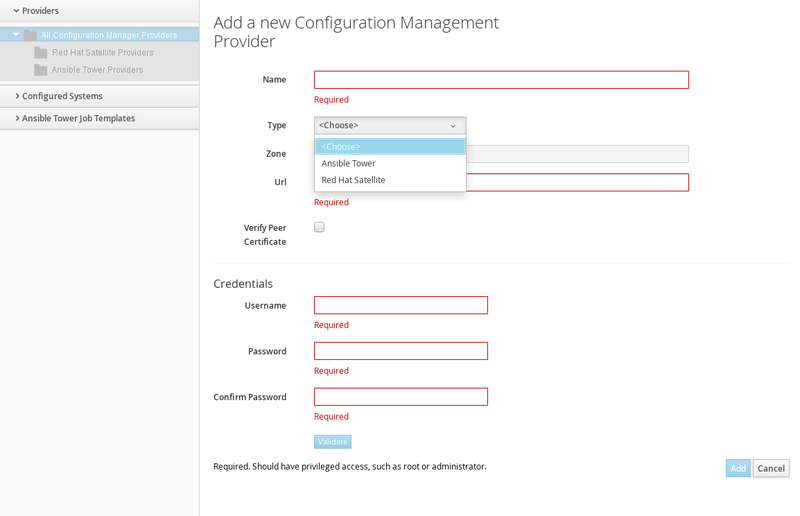 In a Red Hat CloudForms multiple appliance environment, enable the Embedded Ansible server role on a dedicated CloudForms appliance. Add store_session:sql to Ansible playbooks to ensure successful callbacks to CloudForms appliances in a multiple appliance environment. See Deploying CloudForms at Scale for more information on mutiple appliance environments.